Refrigeration technology can be upgraded to control the equipment better to modulate with demand instead of running at a single speed. All aspects of the refrigeration and be upgraded. Existing evaporators and be controlled to operate at 50% of full speed when not loaded by detecting the signal to the compressor that is controlling temperature. Condenser fans can be controlled to reduce speed and maintain pressure more accurately instead of the full on/off system that is standard. Larger systems can have the compressors themselves modulate to maintain pressures again to maintain demand. These upgrades can reduce your cost of refrigeration by up to 50% on any size system. Maintaining the equipment is also very important since the evaporator and condenser coils must be kept clean or they will work twice as hard. Tower utilizes a whole system plan to operate the system efficiency and also minimize costly repairs and service. Tower Energy will evaluate your water and sewer consumption to find ways to reduce usage. Many older systems are using excessive amounts of water that date back to when water and sewer charges were taken for granted and insignificant. Today’s water consumption is no longer insignificant and is becoming more relevant to the environmental health of the area around your facility. Examples of water saving technologies involve re-use of the water, filtration, cooling tower control, water quality sensors and automation. These technologies can also be very cost effective and pay for themselves quickly to also make it a profitable investment. For sure your cost of water and sewer will only go up as the environment struggles with climate change. An investment today is an investment that will go forward and constantly pay you back. Modern energy management systems can transform your aging system or transform your existing non controlled building into a state of the art facility with full control and visibility with remote access. This new technology is wireless and replaces the old hard wired and local software customized systems at a greatly reduced cost. Installation is simple and cost effective with paybacks averaging under 1 year. Old technology such as pneumatics ( air powered controls ) cam be converted or electronically controlled and change the 50’s generation mechanicals to a modern energy efficient system to match new equipment without the expense. During this process the equipment can also be upgraded to variable volume, DCV ( demand control ventilation of outside air ) and entropy ( maximizes use of outside air ) by adding additional sensors to sense occupancy, air quality, static pressure and fan speeds. Advanced simplified scheduling allows for easy real time control to not be married to any hard to control system. The ” brains ” of these systems are all on the cloud so you don’t pay for the dedicated computer that is on site. All the software is off site to prevent crashing and expensive upgrades. Tower Energy has a full service electrical division that specializes in controls to manage energy. Our specialized technicians understand the equipment function also and work with our mechanical division to make sure everything works as planned. Todays control technology involves VSD ( variable speed drives that control motor speeds ) , automated damper and pump actuators ( control flow through control systems ) low voltage wiring ( allows for cables to be strung without conduit ) and sensors that sense everything from DA temp ( discharge air of the heating, cooling or refrigeration ) OA ( outside air temps ) this is used to determine the setpoint requirements of the equipment and boilers ) and RA ( return air ) this is a good indication of what the space temperature really is. Tower Energy also looks at peak demand charges. This can be over 30% or your companies electric bill and is only relative to the KW peak demand during peak utility hours- not actual consumption. Lower this demand charge can be as simple as shifting some operations to off peak or addressing inefficient peak hours technology such as lighting. Other methods can involve co-generation of on site power generation base on fuel cells, natural gas power generation or consistent alternative energy. These paybacks can be very fast and make your cost of manufacturing to down permanently while helping the environment. Today’s lighting technology is changing rapidly, with versatile designs and excellent efficiency. Modern LED lighting can have any color to match your architectural requirements such as color and dimming. LED technology is still evolving to be more efficient and cost less every year. The LED technology of only a year ago is almost obsolete. Tower Energy is an expert in lighting and has installed over 1000 projects to date. We are constantly looking for the newest and best technology to integrate into your project. We have experience in all types of lighting from retail to heavy industrial and explosion proof systems and can recommend the best options. Heat from a variety of sources can be turned into a valuable asset if practical. A good example is a facility with a large refrigeration system that also is using hot water or needs heat for other purposes such as environmental heating. Since the refrigeration expels heat to the outside in order to accomplish the refrigeration cycle, this heat can be diverted or used for another purpose and still maintain the cycle efficiently. Other heat recovery systems may involve hot gas exhaust from a steam boiler. Typically approximately 20% of the heat energy is expelled up the exhaust stack as waste. This exhaust temperature is by average 325 degrees. Heat can be recovered from this exhaust and diverted either back into the feed stock for replacement water, another hot fluid process or pre-warming the input gas back into the burner itself. Exhaust systems with MUA can have a ERV ( energy recovery ventilation ) that passes the outgoing air with the incomming air throug a heat exchanger to capture around 60% of the outgoing energy and transfer it to the incomming air stream. This can cut MUA heating costs by the same amount as the efficiency of the system. Target inductries are heat treating, food proccessing, powder finishing, foundries and MUA for a variety of exhaust processes. Tower Energy specializes in materials and services that are designed to convert your existing roof to a sustainable system. Sustainable means you are transforming or starting with a system that can be sustained by re-applying a maintenance coating on a 10-15 year interval. This is designed to end the tear off cycle and prevent landfilling and expensive replacement costs. These systems are fluid applied and set chemically on the roof to form a seamless system. This method greatly simplifies difficult flashing details on difficult applications such as heavy industrial or fast food restaurants. They are also easily cleaned and serviced. 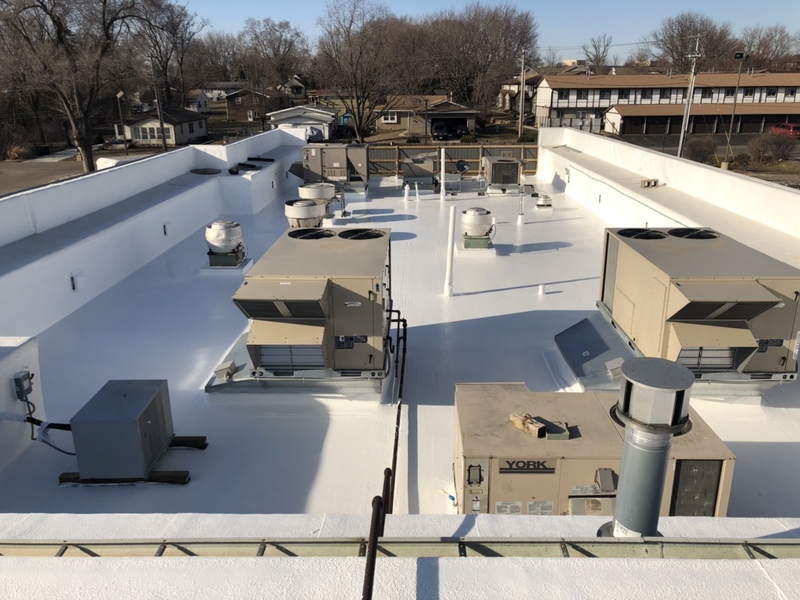 The white finish is a cool roof technology which lowers roof temperatures up to 50 degrees in the sun and reduces air conditioning costs up to 25% even in cold climates. With the roof temperatures being lowered the actual roof temperature is lowered and this allows a longer extension of economizing ability for free use of outside air on all the mechanicals. The advanced polymers are also NSF rated and can be used to collect water for drinking after filtration. This is a common practice in remove areas but can also be utilized for industrial water catchment. The system will not leach containments into the water.